Picking up where we left off, we'll get back to soldering XLR cables today. This is an incredibly useful skill, as we probably use more mic cables (and break more mic cables) than any other. Today, I needed to make up a few 6-foot XLRs for our Worship Director, Jon. Jon needed to hook up his little mixer to the speakers in his office. It's a simple job, here's what to do. First, assemble the tools you'll need for the job. If you missed out on my first and second posts about soldering, you may want to go back and review. Here's what you need. Left to right, you'll need a soldering iron. You can find them at Radio Shack (one of the few things I buy there), or other electronics stores and of course online. You don't need a super-fancy one with electronic temperature regulation. Just a simple 15-30 watt pencil tipped iron will do. My iron is switchable between 15 and 30 watts, though I leave it at 30 almost all the time. Next, a pair of diagonal cutters. These are the smaller ones, and spring loaded. Very handy. 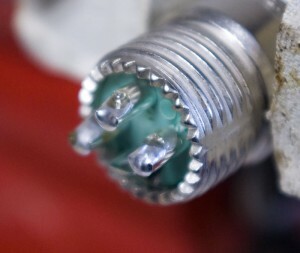 You'll need solder of course, electrical grade--no plumber's solder. The rosin inside the core is different between the two, so get the right kind. It comes in different thicknesses, and as I write this I don't recall which I have, other than it's the thicker kind they stock at Rac-Shack. The super-fine stuff is nice for mini-jacks, but XLRs take so much solder, the thicker variety is faster. Also in the picture are some wire strippers. I like the kind I can adjust to strip all the way to 24 gauge wire, then count on the fact that I've stripped so much (wire that is) that I can tell when I'm through the insulation of thicker wire without nicking the copper. 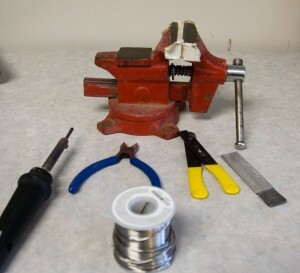 You may wish to get a wire stripper that is calibrated for different gauges of wire while you're learning. A knife is very useful for cutting through the outer jacket of the mic cable. I use a box cutter I got when I worked at a grocery store in high school. But any sharp blade will do. Finally, there's my vice, which is some 30 years old. It looks terrible, but is just the ticket for holding on to the connectors without burning my fingers. The first step is to carefully cut through the outer jacket of the cable. Make your slice about 1/2-5/8" from the end. I normally try to not cut all the way through, then bend the cable at the cut and just touch the blade to the jacket at the cut line. This will split the jacket without nicking a bunch of the copper shield. 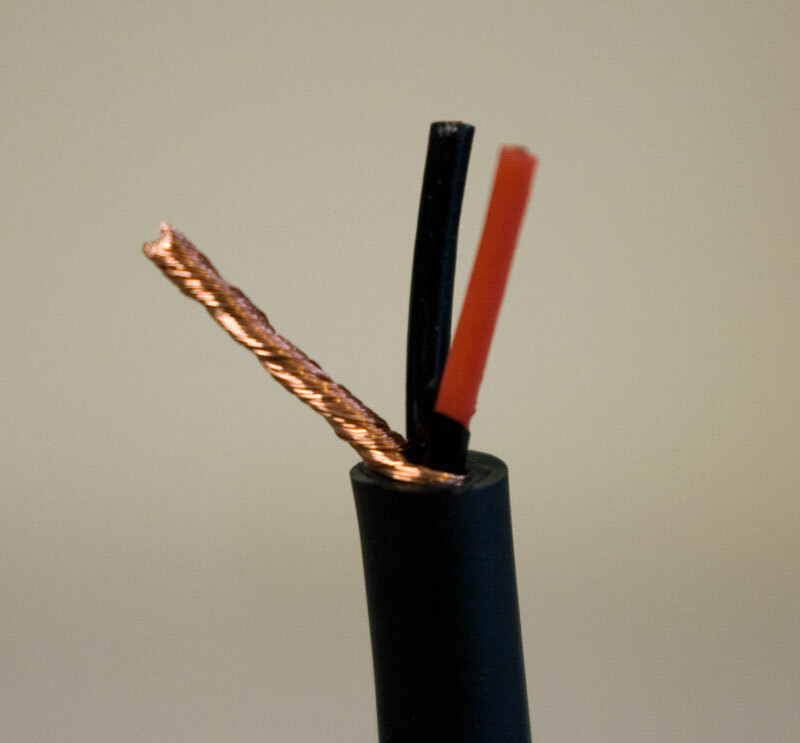 Separate the copper shield from the 2 conductors, taking care to round up all the bare copper strands. Wrap them tightly together. Now if you're using Mogami 2792 (and why wouldn't you?) you'll notice that both the 2 conductors are wrapped in black plastic. This black stuff is actually conductive, and it's one of the reasons this cable is so immune to interference. Any junk that makes it past the copper shield is then shunted to ground via this conductive plastic. As great as it is, it has to go at the ends of the conductors. If you don't take it off, you may find the cable buzzes slightly as the plastic forms a high-impedance ground to the positive and negative solder cups. So make sure you talk it off. Here, I've removed the coating from the red lead. 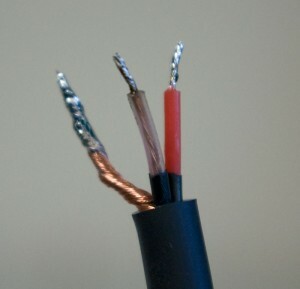 Next thing to do (after you get the black stuff off both leads) is to strip the ends of the white and red conductors. You don't need much, just about 3/16" should do it. Twist the copper strands together tightly, like you did for the shield. Next, we'll tin the leads. Just like last time, put some heat on the wire, and touch the solder to the other side. Just a little bit here, you don't need much. That's kind of a lousy picture, but hopefully you can see the solder is coming just up to the top of the cup. Almost done now. Array the wires in the correct order for the pins. You want to make sure you follow the proper standards when building cables. With 2792, red would be hot or +, so it goes to pin 2. White is cold or -, so it goes to pin 3. The shield always goes to in 1. Switchcraft and Neutrik mold little numbers onto the ends so you know which is which. I like to start with the shield, since it's the biggest. 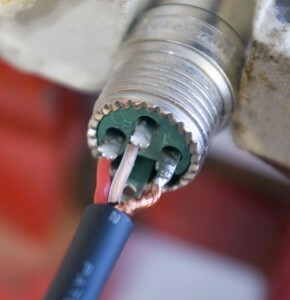 Heat up the solder in the cup, then drop the wire in, making sure to heat up the wire too. You want to get it all nice and hot so the solder flows together. Then remove the heat and wait. The solder will go from shiny and molten to a bit dull and solid. Then you can let go (and cool off your fingers). Do the same for the other two. It should look like the above. Notice the solder is just up to the top of the cup, and everything is nice and neat. 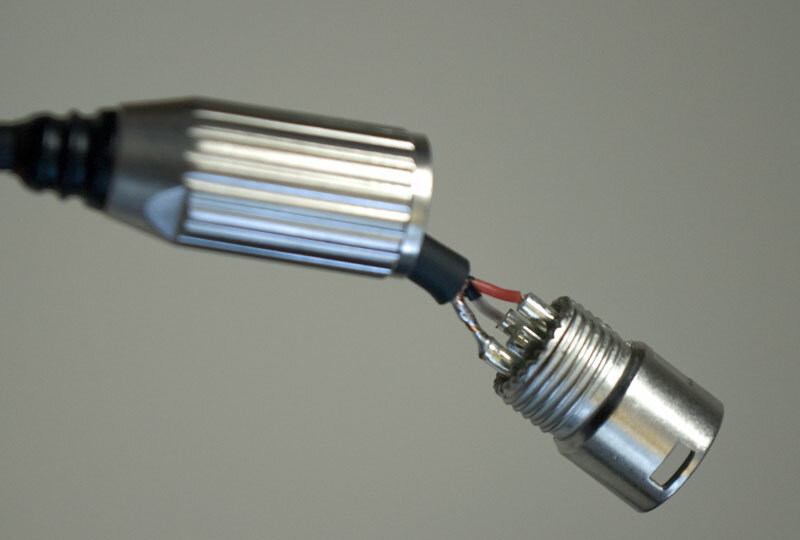 You don't want solder dripping all over the place, and you especially don't want any stray copper or solder connecting any two pins. Finally slide the housing up (you may have a few other parts if you're using Neutrik NC3 series). But this is why I love the Switchcraft AAA series. There are two parts to the connector, and when you're done soldering, slide it up, screw it together and you're done. If you missed the earlier posts on where to get supplies, or how to do unbalanced speaker connections, you can find them here and here. I made this cable for $6.80. It's all top quality material, and it took less than 5 minutes (including picture taking). Buying one of comparable quality would set me (actually, the church) back at least $15-20. And it's just plain fun. So go make some cables, huh?